Based on a large coverage of international material (over 50% of journals covered are published outside US or UK) dating back to 1951, the International Bibliography of the Social Sciences (IBSS) is an excellent tool for interdisciplinary research. 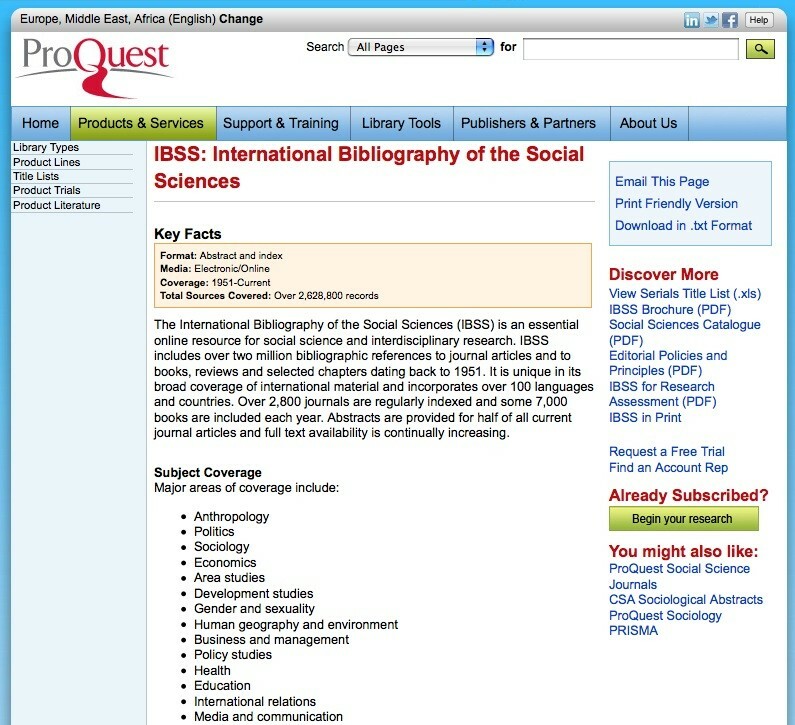 The site includes four specialized databases (for anthropology, economics, politics and sociology) merged into one, with over 2,600,000 bibliographic records in 60 languages and abstracts in English, French, German, Spanish and Italian — thus reflecting the interdisciplinary nature of today’s social sciences. Managed by the Library at the London School of Economics and Political Science and recognized as a repository for social science resources by the European Union, IBSS material is available online (free registration required for UK higher education institutions, paid subscription needed for other users) as well as in other formats (CD-ROM and printed volumes, published annually by Routledge). Regularly updated with about 100,000 records added annually, the IBSS database can be searched with over 10,000 keywords, thus making the information retrieval process very easy. The user interface is quite simple and various help tools are provided, such as a site index, and a support and training area.